There are numerous reasons to try to make an update on exactly how many deputies each of the main political blocs in the Iraqi parliament really controls. Subsequent to the resumption of meaningful parliamentary business in November 2010 – 8 months after the parliamentary elections in March that year – the Iraqi national assembly has seen a string of replacements of candidates for a variety of reasons, as well as cases of very public defections from some of the biggest entities in parliament. With a showdown about the annual budget right around the corner, it makes sense to take stock of the new political balance. This aspect is acutely relevant when it comes to analyzing defections. 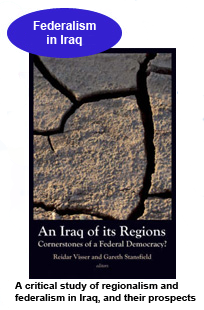 Some politicians declare defections from a sub-bloc (say, the Wifaq movement within the Iraqiyya alliance) but maintain they remain part of the wider bloc. Others insist on starting an entirely independent bloc without any parent coalition. Yet others remain deliberately ambiguous about the question of bloc allegiances, making it problematic to draw conclusions about their true allegiance. Thankfully, the Iraqi parliament office periodically tries to create rosters of current parliamentarians with their affiliations. At least four such attempts have been made with respect to the current parliament, the most recent one being less than a month old. As such, it also purports to capture some of the fallout from one month of boycotting by the secular Iraqiyya coalition, which included some high-level defections. In the new list, the all-Shiite National Alliance has 155 deputies, the secular Iraqiyya 89, the main Kurdish alliance 43, various other Kurdish parties 14, various Iraqiyya breakaway elements 12, various minority (and often pro-Kurdish) representatives 8. Of course it doesn’t add up. Would have been shocking if it did. The official list makes for a total of 321 deputies in the Iraqi parliament, 4 less than there should have been (325). This in turn raises questions about the reliability of the whole thing and the need for a more detailed reexamination. 1. Muhammad Kazim al-Musawi of Dhi Qar (presumably ISCI) replaced ex-VP Adel Abd al-Mahdi on 9 August 2011 but is not listed. 2. Mufid Munim Ahmad of Salahaddin (State of Law) replaced minister Jasim Muhammad Jaafar on 21 January 2012 but is not listed. 3. Hasan al-Sari, affiliated with ISCI and ex-minister of state, returned to parliament 20 September 2011 but is not listed. 4. Khudayr al-Khuazaie (VP) was replaced by Khalid al-Asadi on 16 June 2011; he is not listed. 5. Abdallah Khalaf of Kirkuk Iraqiyya has been listed twice. 6. Fatin Abd a-Qadir, active MP of Iraqiyya, has been listed as National Alliance instead of Iraqiyya. She is thought to belong to Wifaq and there is no specific record of her having changed sides (recently there were rumours about defections in Wifaq in Salahaddin; those, however, defected to White not to National Alliance). 7. Additionally, the empty seat of Khalaf Abd al-Samad who became Basra governor in April 2011 has apparently yet to be replaced. 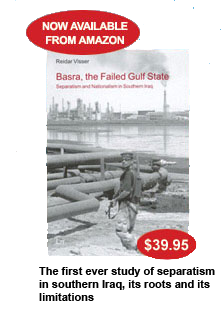 This represents a Basra State of Law seat that is not reflected in the latest lists. 8. Finally, in addition to the apparent mislabeling of Fatin Abd al-Qadir as National Alliance instead of Iraqiyya, it is worth questioning the affiliation of newly returned Ali al-Sajri as Iraqiyya. Sajri has been so outspokenly pro-Maliki – and parliament speaker Usama al-Nujayfi of Iraqiyya fought so hard to prevent him for getting back to parliament – that it makes more sense to consider him as outside Iraqiyya altogether. 9. Noteworthy fact: Still listed as National Alliance are Safiya Suhayl and Sabah al-Saadi who once belonged to State of Law and Fadila respectively. They have declared themselves as independents, though apparently at the sub-bloc level and not leaving the alliance as such. 10. Jabir Habib Jabir of State of Law is still listed but has been appointed Iraqi ambassador in Washington, DC. With correct replacement this will not affect the overall political balance. Now it adds up: National Alliance 159 (including one empty seat), Iraqiyya 88, Kurdish alliance 43, various Kurds 14, various Iraqiyya breakaway elements 13, various minorities 8, total 325. Alhamdulillah. A legal note is in order, too. Last March, parliament violated its own laws and the Iraqi constitution when it approved the membership of several deputies who did not fulfill the legal criteria. Among them were Jawad al-Bulani, whose case was appealed to the federal supreme court and resulted in the invalidation of his membership (it is actually this seat Ali al-Sajri is now getting back). Another case was Jawad Ghanim Ali al-Shuhayli, a Sadrist who ran in Dahuk in Kurdistan and achieved exactly 3 votes and was given a compensation seat for Baghdad in return. To cover up this little affair, the most recent list from parliament now lists him as a Baghdad deputy! Beyond the mathematics and the jurisprudence, the chief political trends in this material are as follows. The main game is being played out with respect to the group of politicians that at some point belonged to the secular Iraqiyya but have signalled independent tendencies. All the other units seem to remain more or less stable, i.e. the Shiite alliance, the Kurds and the minorities. But Iraqiyya has changed. 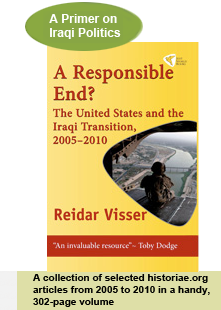 First it lost around 8 deputies when White Iraqiyya (later White) defected in March 2011. Then it won 10 deputies when Wasat (Unity of Iraq plus Tawafuq) joined them in summer 2011. Then it suffered a string of defections after the start of its parliamentary boycott in December 2011, leading to the creation of the Wataniyun group as well as the emergence of Iskandar Witwit as an independent deputy. Additionally, in this period Jamal al-Batikh of White returned to a seat that Iraqiyya had sought to take themselves, and Ali al-Sajri was also given back his seat despite the objections of the Iraqiyya leadership, again emphasizing that his nominal affiliation to Iraqiyya is no longer meaningful. Compared with the situation at the time of the formation of the second Maliki government in December 2010, Maliki now has a slightly larger pool to play with of secular and Sunni deputies interested in cooperating with him than last time (now 13 versus 10 back then, and that included Tawafuq deputies with whom Maliki had a somewhat poisonous relationship anyway.) In theory, Maliki might use this to build a more narrow coalition without Iraqiyya. It is however not enough to enable him to rid himself at the same time of the two coalition partners that tend to make the most taxing demands, i.e. the Kurds and the Sadrists. Even the alternative with a Shiite alliance plus Iraqiyya breakaway factions (without the Kurds) is looking a little vulnerable since at least parts of ISCI (10 seats) would probably shy away from this kind of “political majority” alternative, making it harder for Maliki to reach the critical absolute majority mark of 163. The bigger question is whether Maliki really cares. Many of his latest moves have indicated aloof confidence, with a preference for meeting with Sunni tribal leaders and oil-hungry Asian ambassadors instead of having troublesome national conferences or even receiving the Turkish ambassador. Recently Maliki saw delivery of 131 Abrams tanks from the United States (with a promise of the remaining order of 9 being right around the corner), arriving on time apparently quite regardless of what he was up to politically. Maliki still needs the annual budget to pass, though. In that struggle the Iraqi parliamentarians can still make an impact and their numbers and affiliations remain relevant.